30A gulf front home for sale in the gated community of Sunrise Beach. Located on the west end of 30A, just west of Grayton Beach, this 30A gulf front home has recently been remodeled and features 3 bedrooms, 3 bathrooms, wrap around porches, panoramic gulf views, 2 car garage, 54′ of gulf frontage, an outdoor grilling area, and 1,570 sq. ft. of heated and cooled space. The community of Sunrise Beach is just one block from all the shops, dining, and entertainment of Gulf Place and is minutes from Seaside, Watercolor, and Grayton Beach. Contact us today to view this spectacular 30A gulf front home. 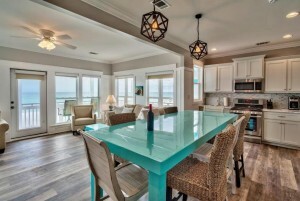 Contact us at The Beach Group at 850.231.9007 for more information on 30A gulf front real estate.